There is a story that an orca came into the harbor at Ostia, Rome’s ancient port, during the reign of Emperor Claudius, right when Claudius was reconstructing the harbor. The orca, or killer whale, was attracted by a local shipwreck, and had been feeding in the harbor for some days when it became trapped by sand. Claudius ordered ships to attack the orca and kill it with lances to entertain the people. This drawing by the artist Jan van der Straet depicts that event as related by Pliny the Elder in his book Natural History. Van der Straet, also called Joannes Stradanus, began his life and training in Flanders but spent most of his career in Florence and other parts of Italy. In the 1590s Stradanus produced a series of engravings entitled Venationes, ferrarum, arium, piscium, pugnae which depicted hunting scenes with a wide variety of animals. The series also included scenes from Natural History, including this example. At the center of the composition and of the action is the monstrous orca, which here looks nothing like a killer whale. Its enormous, broad head and mouth and strangely proportioned body seem to imply that Stradanus was not familiar with killer whales (or perhaps he wanted something more terrifying). The orca is surrounded by attacking ships, and all is contained within the harbor wall, which is topped with a lighthouse, several small structures and many spectators. 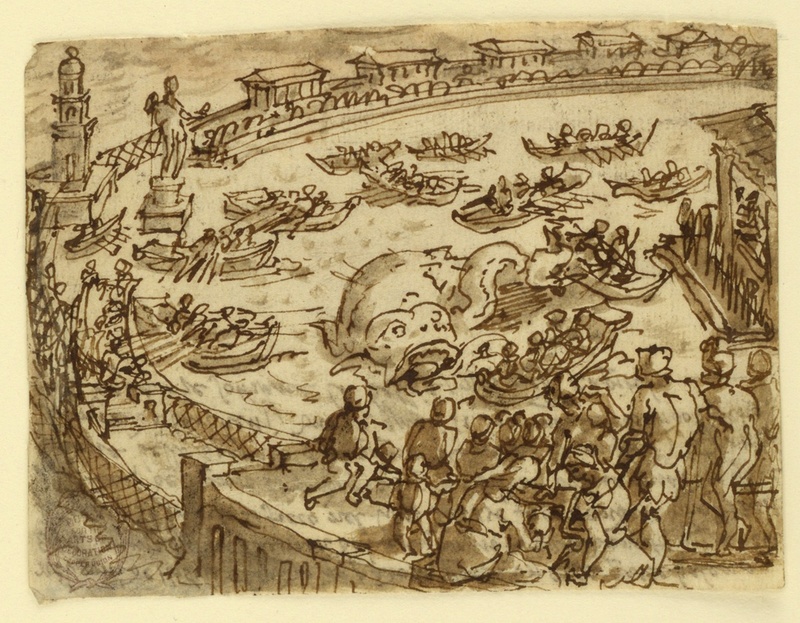 Stradanus’ characteristic drawing technique is evident here in the loose, thick brown lines and heavy use of bistre wash.
Jan van der Straet, An Orca at Ostia, ca. 1595. Cooper Hewitt Collection. The free-flowing lines in this preparatory drawing are a sharp contrast to the exact incisions of the print, seen above, which followed the drawing and is also in Cooper Hewitt’s collection. The composition in the print is almost identical, but reversed, as one of the methods for transferring a drawing to a plate for engraving results in a mirror image of the original. In the print, the generalities of Stradanus’ pen strokes have become precise lines, and the details of the scene – the spectators, ships, and frightening orca especially – have emerged to make this ancient event come to life. On the print itself in small lettering, Stradanus is credited with the design and Adriaen Collaert and Philip Galle are indicated as the engraver and publisher. Stradanus worked frequently with Collaert and Galle to transform his drawings into engraved prints, which were the final versions of his works of art, and in this case the way that Stradanus delivered his aquatic creature into the hands of the public. Amy Namowitz Worthen. “Engraving.” Grove Art Online. Oxford Art Online. Oxford University Press. Vianna Newman was a Peter A. Krueger Intern in the Department of Drawings, Prints, and Graphic Design in the summer of 2015. She has a B.A. in Rome and the Renaissance and Italian from Indiana University. Drawing, An orca at Ostia, ca. 1590. Bistre, pen and ink, wash on paper.. Museum purchase through gift of various donors.